The concepts of Downtown and the Center City may be defined different ways for different purposes. 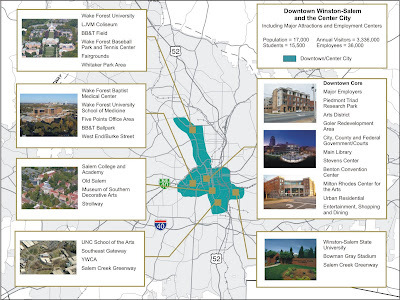 For the purposes of the Legacy Update, the Downtown and Center City area includes Downtown Winston-Salem at its core and expands outwards to include areas of significant activity in the surrounding Urban Neighborhoods Growth Management Area (GMA 2). These areas include: Wake Forest Baptist Health on the west; the UNC School of the Arts, Old Salem, and Salem College on the south; Winston-Salem State University and Bowman Gray Stadium on the east; and Wake Forest University and the stadium, Coliseum, and fairgrounds complex on the north. While some of these areas are not currently perceived as being associated with Downtown, they have the potential of being linked together as part of a vibrant urban center of regional growth, forming the framework for a cohesive Center City growth strategy. The Center City as defined here also includes some of the older urban neighborhoods of Growth Management Area 2 including Holly Avenue, West End, Kimberly Park, Happy Hill, Old Salem and parts of East Winston, Ardmore and West Salem. The integrity of these existing neighborhoods has been kept intact through many neighborhood revitalization and historic preservation efforts. Other neighborhoods have been lost in the past near the Center City due to road construction or other development projects. While this Chapter recognizes the connection between the Downtown and the closest-in neighborhoods, Chapter 11 will contain the actual strategies for the future vitality of neighborhoods.